Cosmic Fortune perfectly combines the old-school slot elements with new and more modern features. In this slot, you’ll get to follow on a journey to outer space where you’ll encounter aliens and massive winnings. The slot contains five different progressive jackpots and two feature games. Cosmic Fortune is another jackpot slot from Net Entertainment. This slot has five wheels with three rows and 15 different paying lines. In this slot, you’ll find a space theme, and all the symbols follow the slots theme. Cosmic Fortune has five different jackpots where three of them are progressive, and two are Fixed Wins. Instead of the classic spinning wheels, here we have dropping symbols which create winning combinations, and the winning blocks then break and exchange with new symbols. You’ll keep getting dropping symbols until you no longer hit a winning combination, then the spin is over. This is very similar to how Gonzo’s Quest works, one of NetEnt’s other slots. Cosmic Fortune offers both Free Spins and a Bonus game where you can win one of the five different jackpots. Free Spins: Also called Free Falls and you’ll get these by hitting three Scatters in the form of golden moons in the main game. In Free Falls you get 10 Free Spins and for every scatter you get in your Free Falls you’ll get an additional 5 Free Spins. During your Free Falls you collect balls at the same time, and when you’re done with the Free Falls, you’ll move on to the exciting Bonus Feature. Bonus Feature: Here you’ll use all the balls you’ve collected in the Free Falls. The Bonus game works just like a classic flipper game where there are nine different holes at the bottom, 5 of these are the jackpots, and you want to hit your balls into these holes. After you’ve hit 3 in the same hole, you’ve won the prize that the hole holds, which hopefully is one of the jackpots. The different jackpots are Rapid, Mini, Midi, Major and Mega where Mega is the biggest one. Cosmic Fortune is a very exciting jackpot slot which combines old and new with the classic flipper style bonus instead of the usual wheel most other Jackpot Slots use. Cosmic Fortune comes with an entertaining space theme with both Free Falls and a bonus game that contains five different jackpots. The slot is entertaining and popular mainly because of the big jackpot the game includes if you’re lucky you can win massive amounts of money in just a few clicks. What makes it so great is that you don’t have to bet that high either, it’s easier to win the jackpot the higher you bet, but it’s still possible to win them on lower bets as well. 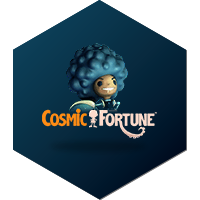 Cosmic Fortune has an RTP of 96.90%, and the smallest bet is 0.3 Euro, and it goes up to 75 Euro per spin.